Grabbing a speaker for your home, or shall we say speakers (in at least in our home), will do nothing but help increase the quality of our lives. Even the most mundane chores (the dishes and laundry for us) can be at least doable if we have some of our favorite tunes blasting. In fact, I can’t remember the last time I cooked without playing at least something in my kitchen. 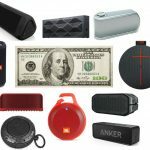 Today we felt the desire to recommend save of our favorite picks as the best speakers for listening to audio at home. We do want to note however that this will be dependent on a few of your own personal preferences, so before we get into our favorite speakers, let’s chat a bit more. 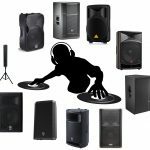 Your budget will of course be a big factor in choosing a specific for your home, or shall we say speakers. If you do want to purchase more than one, be sure to keep that in mind when calculating your cash. As always, we recommend remaining as patient as you can if you find a perfect solution just out of your price range. Next is the type of speaker you feel will be suitable for your home listening endeavors. We do want to note that we personally have more than just one “type”, and even each type we have more than one speaker of. 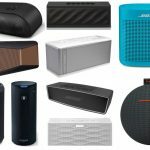 Bluetooth speakers: An obvious choice for many regardless of environment or intended use, Bluetooth speakers come in many different shapes, sizes and personalities. For homes, it’s always useful to have at least a few of these lying around. For example, I have one in my bathroom, another that floats for each room, and a weatherproof speaker I typically keep in my garage and use for the backyard for parties as well. We found some of our favorites below. Soundbars: Typically known for home theaters and TV’s, soundbars are actually extremely powerful due to their size. Therefore, we like keeping this as an option for those needing to sound up their homes since many come with Bluetooth. We use ours frequently when we have guests over, or if we need to get into a cleaning zone. Bookshelf speakers: Another TV or theater option, bookshelf speakers are also great for homes regardless of room. They’re also able to be mounted onto a wall which can help with aesthetics and keeping your area clean. Studio monitors: Most individuals use these for their home studios, but we love them for any use since they give us a big important factor in our opinion — accuracy. For example, although we do have studio monitors in our studio as we’re typing this right now, we always have a separate pair in the living room at our vinyl station. 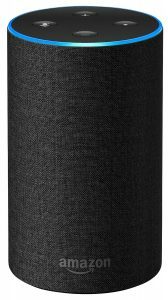 Up first as the best speaker for homes, we have what some technically call a ‘360 speaker‘ however still falls under the Bluetooth category. The Revolve is great for homes because you can place it in the middle of a room and have it deliver sound all-around, hence the “360 degrees” title. If you do place it near a wall, it can still be feasible as it will reflect off of the wall. This thing can also go outdoors if you want to travel with it outside of your home. 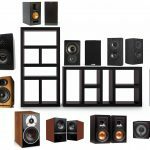 Although “smaller” sized as compared to some other speakers out there (as well as in this list), you’re getting some great power that will at least cover a few rooms at a time. It has a decent internal build made of ‘dual-passive radiators’ which helps with efficiency and acoustics. It’s also equipped with a very rugged build in case it falls over (you never know in a home, especially with kids around) as it has a significant soft-material shell that allows for absorbing falls. What makes this our favorite pick however is the Google Assistant feature, as well as an entire app to control the speaker from your phone. We love the Bose SoundLink Revolve as the best speaker for your home to kick off our list. Let’s talk high-quality bookshelf speakers for listening to music, movies, shows and more in your home. The T15 are one of the highest rated bookshelf speakers in the world, so this will be a no brainer if it’s indeed the type you’re looking for (and can of course fit in your budget). For this pair, we have a very specialized sound that focus on ‘accuracy’ and ‘detail’, since it has dynamic balanced drivers and separate components for both low and high-end frequencies of sound. No need for a subwoofer in our opinion (there is a front mounted bass port), although you can always sync one up later on if you need some more thump. There is a magnetic shield for enclosures which aids in decreasing disruptive noise or feedback, and a keyhole hanger if you don’t want to simply rest these on shelves. The specs are pretty decent if you’re into numbers, as we get a 45 Hz to 24 kHz frequency response, 89 dB sensitivity and a nice 100 watts of power per channel. 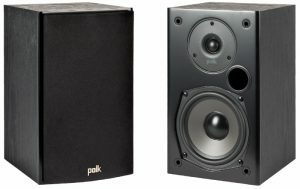 Check in to the Polk Audio T15 as the best speakers for your home if you’re into a bookshelf application to liven up your home’s sound. Now let’s look into a highly rated soundbar by VIZIO in case this is an option you were thinking of. Although it may be deceiving at first considering this is for TV’s, you’d be surprised at how much power you can get out of this thing and send sound through your entire home. We use our soundbar all of the time for parties since it’s at the front and center of our home in the living room, but it will definitely depend on the layout of your house and what your needs are. 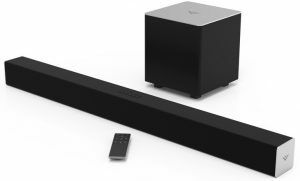 There are literally hundreds of soundbars out there so if this one is either out of your price-range or you just aren’t feeling it, there are definitely other options for you to consider. However, we love this soundbar because we personally use it and have done so for about 3 years now with no problems. The specs are also quite nice for the price, as it brings us 100 dB of sound, a wireless subwoofer that syncs up with the bar, and an overall solid construction to last you years as an investment. Check out the VIZIO SB3821-C6 for a nice soundbar option for your home. Let’s bring in another one of our favorite Bluetooth speakers for homes. 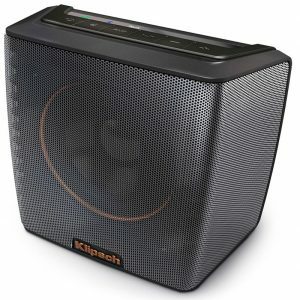 Klipsch’s relatively new speaker has some nice features offered here — 8 hours of battery life, splash resistance in case you’d like to bring this near your pool or by the bathroom (or really just knowing it’ll be safe from accidents anywhere else in the house), and nice specs with a 3″ high-end driver with dual side-firing passive bass radiators. 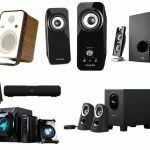 The overall shape of the speaker is what is nice for homes here, since you can place it in a corner or side of a room and you’ll be getting a great projected sound to fill up your room very easily. The big kicker with this one is the power-to-size ratio, however. The 3″ drivers are very powerful and have advanced equalization that a lot of other cheaper speakers don’t have. It’s also great for travel due to this so if you’re also looking for a portable speaker to invest in, the Klipsch Groove is a good one to grab. Well, this one may be debatable as the best speaker for home listening as many of us are already of what this thing can do. 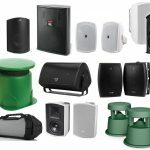 However, you can’t ignore its effectiveness and the popularity it’s gained for quite a few reasons, especially when it comes to overall sound for homes. This particular version, their latest 2nd generation, is very affordable and just does what it’s supposed to do — bring a useful and convenient voice assistant along with a speaker with enough power to fill most rooms. 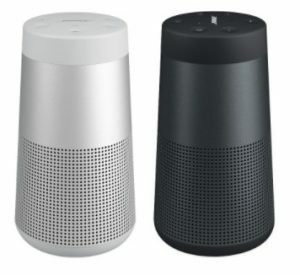 You can of course go for other voice-activated speakers, but typically you’re going to find either Google or Amazon in one of those. To us, the Amazon version is the winner but we’ve seen hundreds of debates about which voice assistant speaker you should buy. We’ll leave that decision up to you, but what stands out with the Echo is the music playing, reminder setting, question asking, syncing with smart home devices (if you’re into that), and way too much more to name. Look into the Amazon Echo, it’s only about a hundred bucks anyways. Halfway through our guide of the best home speakers, this pick is for those looking to power up some sound for a family gathering outside, BBQ, or those also bringing their speaker on trips to the lake or beach. 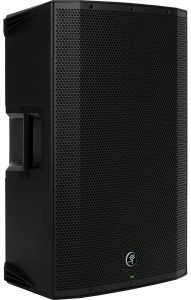 The M90 is a very popular weatherproof speaker at a surprisingly low price. 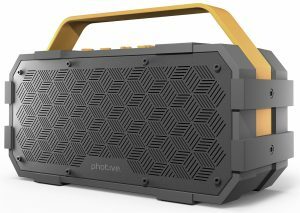 Here’s what we’re getting — waterproof and shock-absorbing (IPX5), a very boosted low-end for great bass in a separate subwoofer component, 20 watts of power, a 10 hour battery life, and very convenient design with a handle that mimics a toolbox. The power isn’t necessarily as high as others in this one (such as the soundbar or the 100 watts in the T15’s), so we wouldn’t recommend this one if it’s just going to be chilling inside. This instead is for the outdoor home users needing a safe option with extra protection against water and shock. Also great for those traveling instead of just using this speaker for their homes. We love the Photive M90 if it suits your particular needs when it comes to the best speakers for home listening. Now an appearance from one of our favorite pairs of studio monitors of all time. 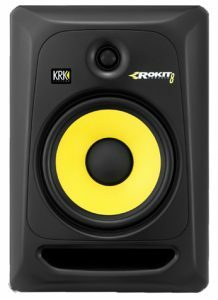 KRK’s entire Rokit series is legendary at this point in our opinion, and brings us our first option of monitor speakers that are typically meant for music production into our list. Don’t let that particular use discourage you, however — what it really means is that these are meant for those who mix and master sound, which in the end is specialized for simply providing accuracy and clarity with no boosts in any of the frequency range. Whether or not this is important for you will depend (we know many who want a boosted bass on purpose). 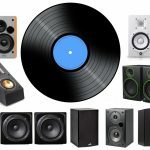 If you are concerned with bass (it isn’t going to rattle walls or windows but you still hear the bass very clearly — we’re listening on these right now at our computer), you can always purchase a subwoofer separately if that’s a concern. In regards to specs, the 8 G3 have an 8″ woofer (glass-Aramid composite), a 1″ tweeter (soft-dome), frequency range of 35 Hz to 35 kHz, and highly effective bi-amped, class A/B amp with SPL going up to 109 dB. Yes, these can get super loud, but most importantly provide some extremely accurate sound for your home. The KRK Rokit 8 G3 are simply beautiful. Another pair of bookshelf speakers here for your home, but this time a lot higher in quality in case you have a larger budget than the previously listed T15’s and want some more power and accuracy in your sound. The entire Reference Series by Klipsch is exceptional, and this is one of their higher-rated pairs of bookshelf speakers from that line. A lot of reviewers out there praise the quality spanning from its build all the way to the internal parts it’s made of. We have a 1″ tweeter made of aluminum with something called ‘Linear Travel Suspension’, and a 4″ woofer that’s copper-sun with high-output IMG. The build is beautiful made of brushed black polymer veneer cabinet and will not only last a long while but look great in most settings (those gold ports definitely pop out in our opinion). 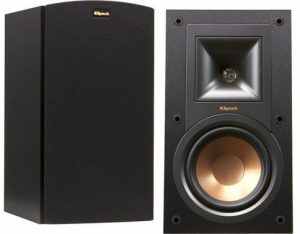 Another great pick as the best speakers for homes, this time with a super high-quality pair in the Klipsch R-14M. Not happy with the power in any of the previous picks? Looking to go big? We mean, very big here, and although technically comparable to literally a portable PA system, this is the real deal for those really wanting sound and power in their homes. Here are some important specs for this (and trust us, they stand out) — 1,000 Watts of total system power, a 15″ woofer, 1.4″ compression driver, dynamic bass response, 2-way crossover, transducer time alignment, an adjustable 3-band EQ for those who like to tweak the sound, and lastly a mic\line output if you want to add some microphones (karaoke much?). They also sync together, so grabbing two Mackie THUMP‘s at a time will be more than enough power for any sized home. As you can see, this is definitely overboard for those just wanting a simple speaker solution, so for many this may not be feasible. However, for those who want to power up a very large house, or are having a big party in the backyard and need to power up a DJ or just flat-out go big, be our guest. We reviewed these personally and the sound was way too loud for our entire house (1,600 sq. ft.), but is there such thing as too much for some of us? Look at the Mackie Thump 15 if you’re in a big home or just simply want a beast — pair up 2 of these and you’re good to go. Last but not least to end our guide of the best home speakers, we have an entire system as a last resort recommendation in case you’ve scrolled down this far without any option sticking out to you. There are too many of these to count available in the market today, but as a one option, this is the best pick we’d recommend if we absolutely had to go with just one solution for an entire sound system for homes. 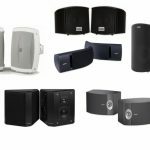 This is a 5.1-channel home theater system, meaning you have 5 pieces altogether with a dedicated subwoofer (with 8″ 100 watts all by itself). It will of course set up to your TV but you’re also able to hook up your phone to this to control the music remotely via Bluetooth. There are also some other fancy features included, such as 4K Ultra HD pass-through, compressed music enhancer, and some extra-low end in that hefty subwoofer in case you want to crank that bass. The Yamaha YHT-3920UBL is our last pick as the best speakers for home listening in case you want an entire system to power up the sound for your house.